Above photo, Meredith Bolen (left) and Kristen Hirst (right) recovering fragments of a shattered tortoise shell. 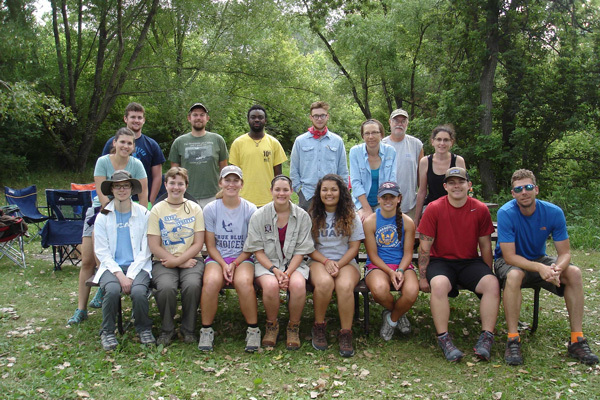 This past summer, 9 Westminster students – Meredith Bolen ’16, Devin Brown ’18, ChristiAna Dunham ’18, Kristen Hirst ’18, Hannah Hubbard ’18, Jessica Kinkade ’18, Tjikuzu Tjizembua ’16, Sawyer Young ’18, and Yuchen Shang ’18 – took part in a paleontological expedition in Toadstool National Park and the Dakota Grasslands led by Dr. David Schmidt, Assistant Professor of Environmental Science. Other findings included a very large and complete tortoise shell, an enteledont (a large extinct peccary-like animal) mandible, a fairly complete dinosaur limb bone, a concentrated vertebrate microsite, and petrified stumps believed to be part of an ancient forest. 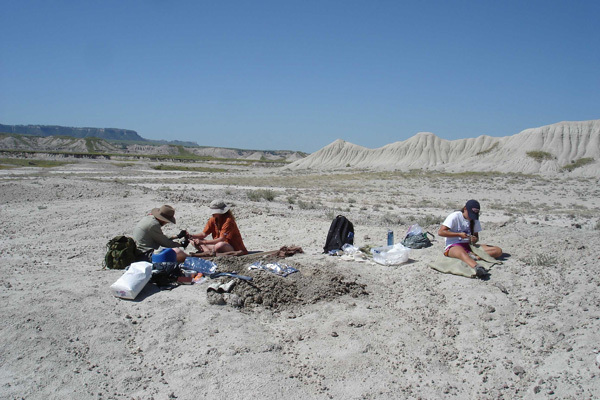 Sawyer Young (far left), Meredith Bolen, and Taylor Howard (far right) assisting with the enteledont jaw excavation. Kristen Hurst ’18 says that, while the hiking and summer heat were challenging, finding that first fossil was the best part of the trip. 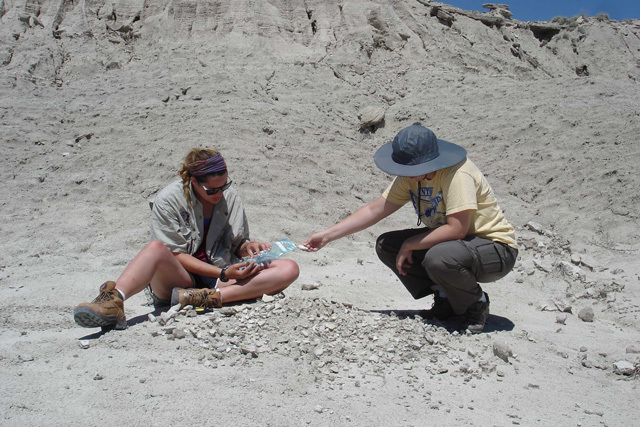 Dr. Irene Unger (left) and Tjikuzu Tjizembua (right) excavating coprolites. For Meredith Bolen ’16, the research was the best part of the trip. Bolen also says she learned about a lot about both the real-life aspects of a geologist, including the hardships of going into the field in challenging weather conditions and dealing with finances, and about herself. Ruga echoes Bolen’s sentiment and says this experience reinforced how much she loves geology and paleontology. Back row, from left to right: Devin Brown, Garrett Williamson (graduate student at Stephen F. Austin University), Tjikuzu Tjizembua, Sawyer Young, Dr. Irene Unger, Dr. Tim Walsh from Wayland Baptist University, Dr. Dawn Holliday. Middle, far left: Dr. Danica Buzniak. Front, from left to right: Jessica Kinkade, Kristen Hirst, Mikaela Ruga, Meredith Bolen, ChristiAna Dunham, Taylor Howard, Hunter Green (graduate student at Fort Hays State University), and Dr. David Schmidt. Kudos to Dr. Schmidt, Dr. Unger, Dr. Walsh and Dr. Holliday for providing this fantastic hands-on opportunity for these blossoming scientists. An experience like this will definitely help them on their way to successful careers.